this is a blog called geometricsleep. : It's 12:31 am, do you know where your children are? It's 12:31 am, do you know where your children are? This child is making a ham and cheese sandwich and inexplicably wearing an H&M tank top, pajama pants from Gap and... Proenza Schouler boots? Why? I have no idea, but all of a sudden they were on my feet. This shoe thing is getting ridiculous, you guys. Ps. 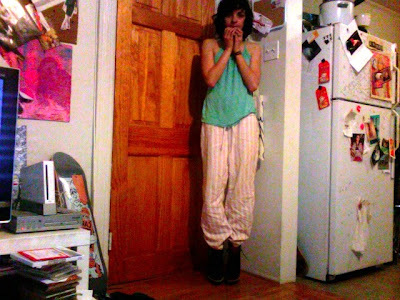 I secretly LOVE these pants with these shoes? I swear Jack and Lazaro can do NO WRONG. 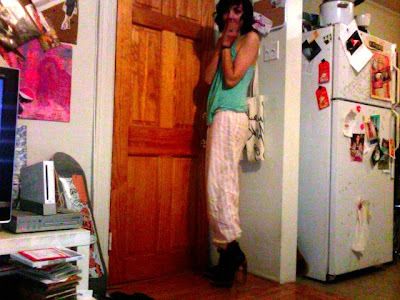 I love the pajama-proenza juxtaposition. So hilariously great. For some reason, this look SO FREAKING GOOD. Like, if I saw you walking down the street in that, I would be like "dude, how is she rocking pajamas???!!!" you should try it sometime.